This succulent nutty quinoa salad wouldn't be the same without its delicious ginger dressing. It gives a refreshing flavour to the almonds and pistachios, whilst the sesame oil flavour complements the soy beans. Quick to make and easy to store for later in the day or just to take to that picnic. All fresh ingredients enhance each other whilst leaving you satisfied. Rinse the quinoa first and add to a saucepan with two cups of water. Bring to boil for two minutes. Reduce heat to low, cover and simmer until tender and most of the liquid has been absorbed, 15 minutes. Fluff with a fork. Let it cool off. Make the dressing by mixing all the ingredients. Place in fridge. 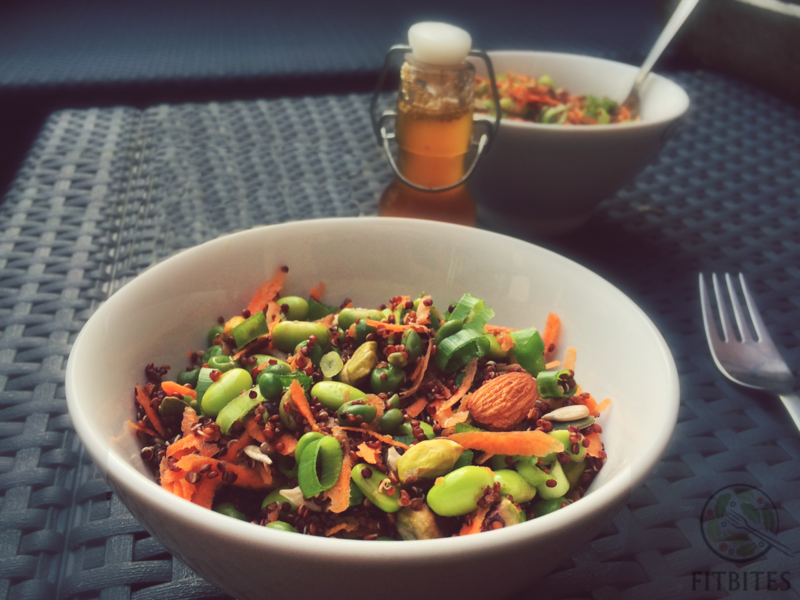 Add the carrots, peeled soybeans peas, seeds and nuts to the quinoa and blend well. Top with the chopped scallions and serve with the dressing. Enjoy! Tabbouleh is surely a world dish! 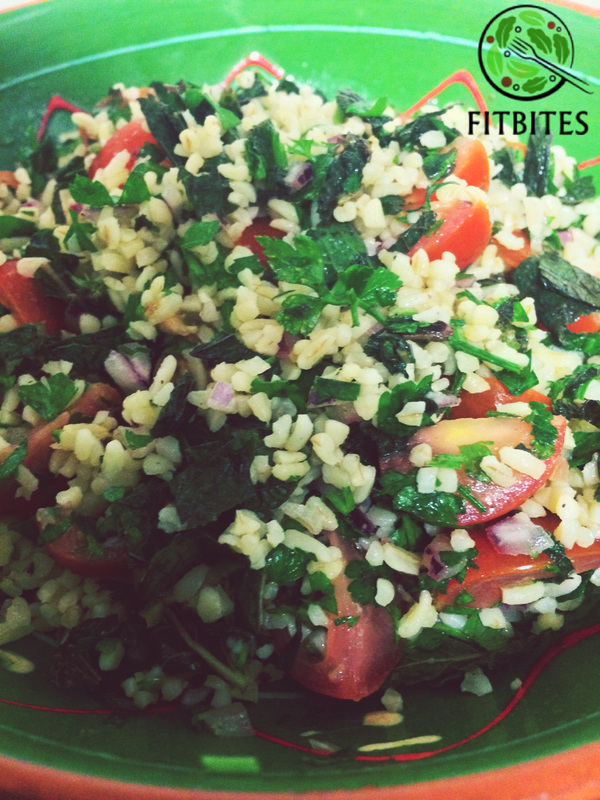 Just like Caprese or Ceasar salad, Tabbouleh is a salad to make every now and then to feel happy. This Middle Eastern dish is so fresh and tasty you would wish to make it everyday! Cook the bulgur with 2 cups of water. Bring to boil for two minutes. Reduce heat to medium low, cover and simmer until tender and most of the water has been absorbed. Fluff it using a fork until the grains are separated. Add the finely chopped parsley, mint and onion to the tomatoes and mix well until combined. Mix with the bulgur and add the lemon juice and olive oil. Mix well. 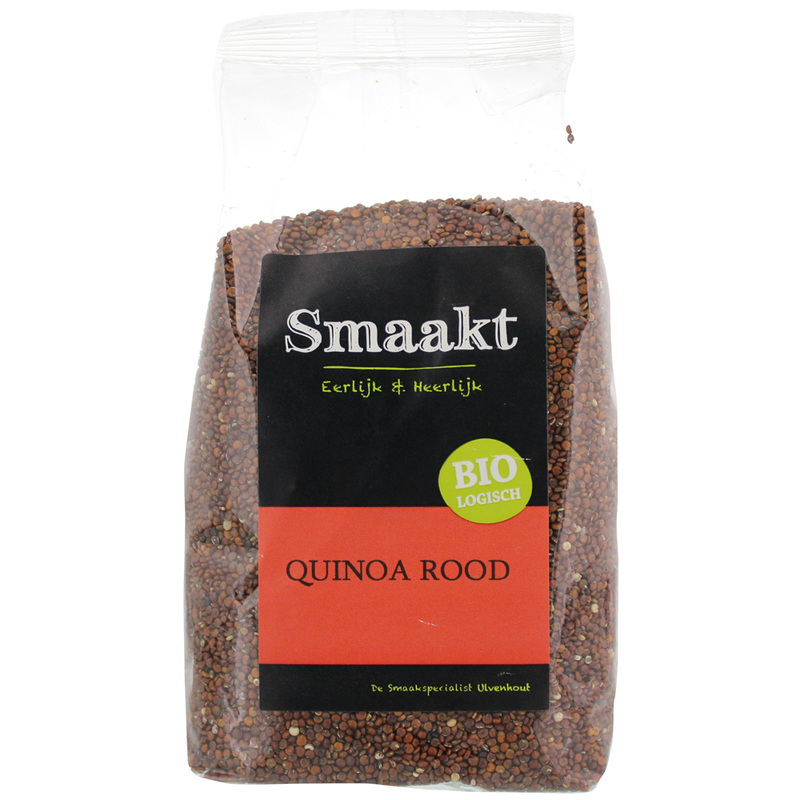 Red quinoa is nothing more than the beautiful sister of pretty white quinoa. The nutritional value is basically the same. However it takes a tad longer to cook, is crunchier and has a nuttier flavour. Red quinoa looks gorgeous in salads (we reckon lots of recipes are on their way) plus its amazingly versatile. Thanks to the tuna and avocado this recipe is a good source of Vitamin B12, Phosphorus and Manganese, and a very good source of Protein, Vitamin K, Niacin and Selenium. The combination with lemon will amaze you! 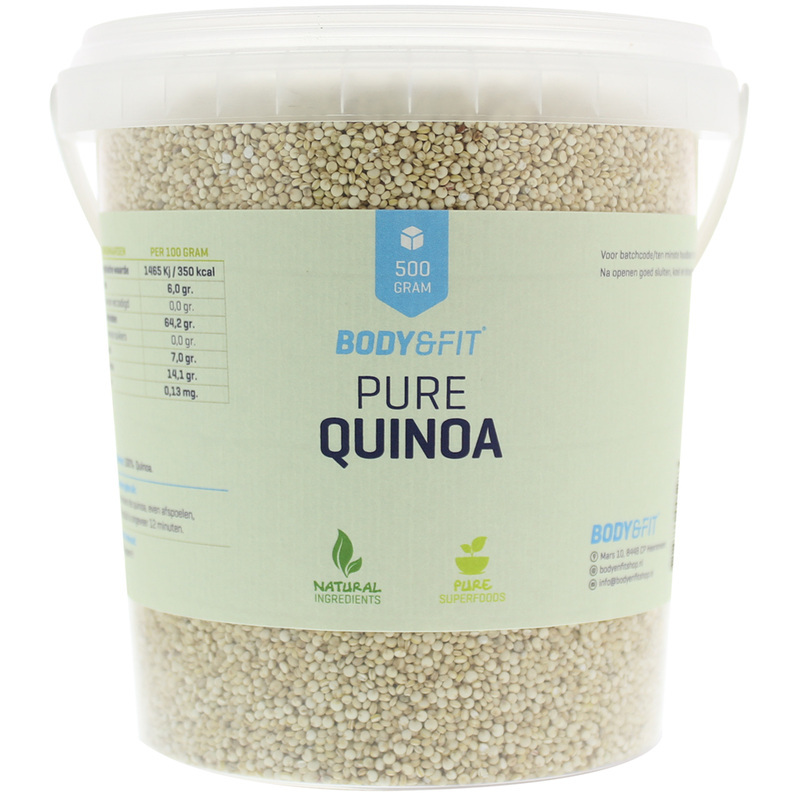 Rinse the quinoa first and add to a saucepan with two cups of water. Bring to boil for two minutes. Reduce heat to low, cover and simmer until tender and most of the liquid has been absorbed, 15 minutes. Fluff with a fork. 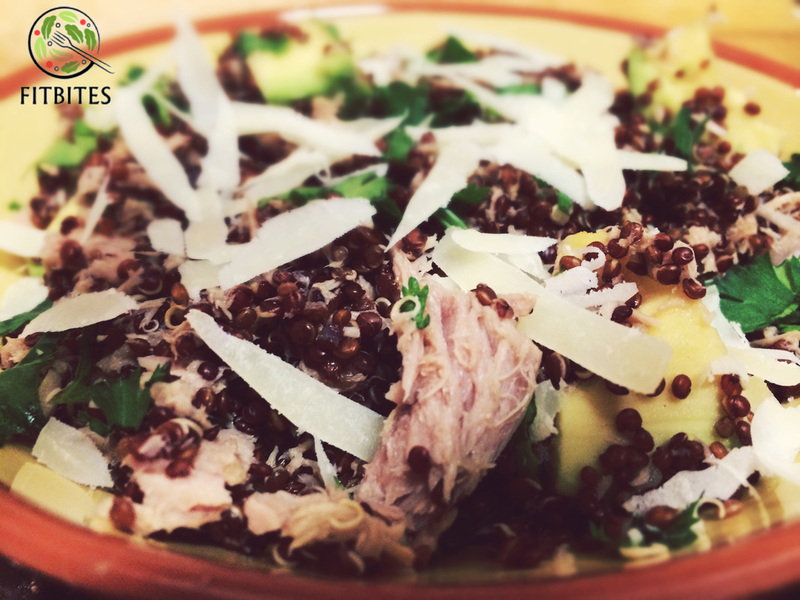 While it cools off, drain the water from the tuna and mix with the avocado and coriander. Add the quinoa to the tuna mix and after stirring a bit add the lime juice and a dash of ground black pepper to taste. Serve and sprinkle parmesan cheese on top! There are certain foods we can eat as much as we want! And that is the key in maintaining your energy levels. Eat as much as you want low calorie, low fat, low carb items, chock full of vitamins ... and that can only be SALADS! The secret to a healthy dressing? Make it yourself!! Our low calorie dressing recipe will give a succulent taste to your salad and keep those calories in check. By stocking on the bottled ingredients with longer shelf life will allow you to put together a salad in no time and make something incredibly yummy. Cook the chicken breast in boiling water for 15 minutes or until chicken is completely cooked. In the meanwhile make the dressing. Mix in a jar (with airtight seal) all ingredients and shake well. You can add more honey if necessary or more olive oil until the flavour is balanced. Store the jar in the fridge, you can keep in the fridge for up to ten days. Drain the water and let the chicken cool off for 10 minutes or longer. Heat up the oven to 175 degrees. Shred the entire breast chicken with your fingers and then mix the chicken with the olive oil, crushed garlic and add a dash of ground pepper. Spread the chicken on a oven-proof plate and put in the oven for 10-15 minutes or until the chicken is crispy. When done, let it cool off on the side. Serve the rocket/baby spinach salad on a plate, and toss the tomatoes, feta cheese, olives, capers and seeds on top. Add the chicken and pour 2-3 tbsp of the dressing and enjoy!